Did you just make the jump to get hearing aids? If so, congratulations! Hearing loss is a natural part of the aging process and this step in getting hearing aids will help improve your ability to communicate. But with everything in the world, nothing is absolutely perfect. First, there is going to be an adjustment period. You might hear sounds that you haven’t heard in some time, especially if you waited to get your hearing tested. Hearing aids can only amplify the sounds. So understand that some sounds may sound slightly different than they did before. 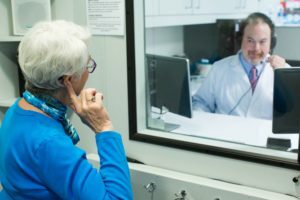 Many hearing professionals say that it will take 30 to 90 days for you to get used to the hearing aid. Stick with it! Most people do not wear their hearing aids because of unrealistic expectations. So be patient with yourself and the device. When you first wear your hearing aids, expect there to be some discomfort. Make sure that the fit is comfortable before you leave the office, but understand they’re like a new pair of shoes and may just need some getting used to. If this persists, contact your audiologist to make sure the fit is correct. In the beginning, the amplification can seem overwhelming. Your own voice may sound different and things around you may seem too loud. Many hearing professionals suggest wearing the hearing aids slowly for shorter periods of time in a quieter environment to get used to them. Then gradually start to work up to noisy places and environments. Your brain will eventually learn to understand the amplified sound that the hearing aids are producing and it will not seem as loud. Remember that not everything will be perfectly clear with the hearing aids and you may still miss some parts of the conversation. But in the end, the hearing aids will help to amplify the sound for you to hear better.